hereinafter referred to as "the Union"
hereinafter referred to as "Indonesia"
1. The objective of this Agreement, consistent with the Parties' common commitment to the sustainable management of all types of forest, is to provide a legal framework aimed at ensuring that all imports into the Union from Indonesia of timber products covered by this Agreement have been legally produced and in doing so to promote trade in timber products. 2. This Agreement also provides a basis for dialogue and co-operation between the Parties to facilitate and promote the full implementation of this Agreement and enhance forest law enforcement and governance. "legally-produced timber" means timber products harvested or imported and produced in accordance with the legislation as set out in Annex II. 1. A Forest Law Enforcement, Governance and Trade licensing scheme' (hereinafter "FLEGT Licensing Scheme") is hereby established between the Parties to this Agreement. It establishes a set of procedures and requirements aiming at verifying and attesting, by means of FLEGT licences, that timber products shipped to the Union were legally produced. In accordance with Council Regulation 2173/2005 of 20 December 2005, the Union shall only accept such shipments from Indonesia for import into the Union if they are covered by FLEGT licences. 2. The FLEGT Licensing Scheme shall apply to the timber products listed in Annex IA. 3. The timber products listed in Annex IB may not be exported from Indonesia and may not be FLEGT licensed. 4. The Parties agree to take all necessary measures to implement the FLEGT Licensing Scheme in accordance with the provisions of this Agreement. 1. The Licensing Authority will verify that timber products have been legally produced in accordance with the legislation identified in Annex II. The Licensing Authority will issue FLEGT licences covering shipments of legally-produced timber products for export to the Union. 2. The Licensing Authority shall not issue FLEGT licences for any timber products that are composed of, or include, timber products imported into Indonesia from a third country in a form in which the laws of that third country forbid export, or for which there is evidence that those timber products were produced in contravention of the laws of the country where the trees were harvested. 3. The Licensing Authority will maintain and make publicly available its procedures for issuing FLEGT licences. The Licensing Authority will also maintain records of all shipments covered by FLEGT licences and consistent with national legislation concerning data protection will make these records available for the purposes of independent monitoring, while respecting the confidentiality of exporters' proprietary information. 4. Indonesia shall establish a Licence Information Unit that will serve as a contact point for communications between the competent authorities and the Licensing Authorities as set out in Annexes III and V.
5. Indonesia shall notify contact details of the Licensing Authority and the Licence Information Unit to the European Commission. The Parties shall make this information available to the public. 1. The competent authorities shall verify that each shipment is covered by a valid FLEGT licence before releasing that shipment for free circulation in the Union. The release of the shipment may be suspended and the shipment detained if there are doubts regarding the validity of the FLEGT licence. 2. The competent authorities shall maintain and publish annually a record of FLEGT licences received. 3. The competent authorities shall grant persons or bodies designated as independent market monitor access to the relevant documents and data, in accordance with their national legislation on data protection. 4. The competent authorities shall not perform the action described in Article 5(1) in the case of a shipment of timber products derived from species listed under the Appendices of the CITES as these are covered by the provisions for verification set out in the Council Regulation (EC) No 338/97 of 9 December 1996 on the protection of species of wild fauna and flora by regulating trade therein. 5. The European Commission shall notify Indonesia of the contact details of the competent authorities. The Parties shall make this information available to the public. 3. The Parties may, by agreement, establish electronic systems for issuing, sending and receiving FLEGT licences. 4. The technical specifications of the licence are set out in Annex IV. 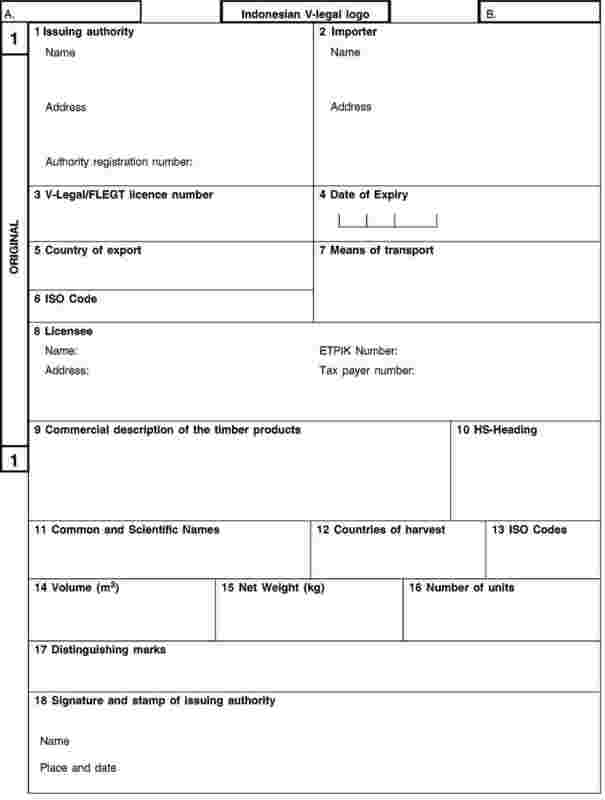 The procedure for issuing FLEGT licences is set out in Annex V.
1. Indonesia shall implement a TLAS to verify that timber products for shipment have been legally produced and to ensure that only shipments verified as such are exported to the Union. 2. The system for verifying that shipments of timber products have been legally produced is set out in Annex V.
1. The procedures governing release for free circulation in the Union for shipments covered by a FLEGT licence are described in Annex III. 2. Where the competent authorities have reasonable grounds to suspect that a licence is not valid or authentic or does not conform to the shipment it purports to cover, the procedures contained in Annex III may be applied. 3. Where persistent disagreements or difficulties arise in consultations concerning FLEGT licences the matter may be referred to the Joint Implementation Committee. fraud in obtaining or using FLEGT licences. 1. Using the Indonesian TLAS, Indonesia shall verify the legality of timber exported to non-Union markets and timber sold on domestic markets, and shall endeavour to verify the legality of imported timber products using, where possible, the system developed for implementing this Agreement. 2. In support of such endeavours, the Union shall encourage the use of the abovementioned system with respect to trade in other international markets and with third countries. 3. The Union shall implement measures to prevent the placing on the Union market of illegally-harvested timber and products derived therefrom. 1. Indonesia will hold regular consultations with stakeholders on the implementation of this Agreement and will in that regard promote appropriate consultation strategies, modalities and programmes. 1. In order to minimize possible adverse impacts of this Agreement, the Parties agree to develop a better understanding of the impacts on the timber industry as well as on the livelihoods of potentially affected indigenous and local communities as described in their respective national laws and regulations. a more favourable perception of FLEGT-licensed products on the Union market. 1. The Parties shall establish a joint mechanism (hereinafter referred to as the "Joint Implementation Committee" or "JIC"), to consider issues relating to the implementation and review of this Agreement. 2. Each Party shall nominate its representatives on the JIC which shall take its decisions by consensus. The JIC shall be co-chaired by senior officials; one from the Union and the other from Indonesia. 3. The JIC shall establish its rules of procedure. 4. The JIC shall meet at least once a year, on a date and with an agenda which are agreed in advance by the Parties. Additional meetings may be convened at the request of either of the Parties. prepare, approve, distribute, and make public annual reports, reports of its meetings and other documents arising out of its work. perform any other tasks it may agree to carry out. The Parties agree to use the reports and findings of the following two mechanisms to evaluate the implementation and effectiveness of this Agreement. Indonesia, in consultation with the Union, shall engage the services of a Periodic Evaluator to implement the tasks as set out in Annex VI. the Union, in consultation with Indonesia, shall engage the services of an Independent Market Monitor to implement the tasks as set out in Annex VII. 1. The provision of any resources necessary for measures to support the implementation of this Agreement, identified pursuant to Article 14(5) (f) above shall be determined in the context of the programming exercises of the Union and its Member States for cooperation with Indonesia. 2. The Parties shall ensure that activities associated with the implementation of this Agreement are coordinated with existing and future development programmes and initiatives. 1. The Parties shall ensure that the workings of the JIC are as transparent as possible. Reports arising out of its work shall be jointly prepared and made public. the number of cases and quantities of timber products involved where consultations took place under Article 8(2). 3. In order to achieve the objective of improved governance and transparency in the forest sector and to monitor the implementation and impacts of this Agreement in both Indonesia and the Union, the Parties agree that the information as described in Annex IX shall be made publicly available. 4. The Parties agree not to disclose confidential information exchanged under this Agreement, in accordance with their respective legislation. Neither Party shall disclose to the public, nor permit its authorities to disclose, information exchanged under this Agreement concerning trade secrets or confidential commercial information. This Agreement shall apply to the territory in which the Treaty on the Functioning of the European Union is applied under the conditions laid down in that Treaty, on the one hand, and to the territory of Indonesia, on the other. 1. The Parties shall seek to resolve any dispute concerning the application or interpretation of this Agreement through prompt consultations. 2. If a dispute has not been settled by means of consultations within two months from the date of the initial request for consultations either Party may refer the dispute to the JIC which shall endeavour to settle it. The JIC shall be provided with all relevant information for an in depth examination of the situation with a view to finding an acceptable solution. To this end, the JIC shall be required to examine all possibilities for maintaining the effective implementation of this Agreement. 3. In the event that the JIC is unable to settle the dispute within two months, the Parties may jointly seek the good offices of, or request mediation by, a third party. 4. If it is not possible to settle the dispute in accordance with paragraph 3, either Party may notify the other of the appointment of an arbitrator; the other Party must then appoint a second arbitrator within thirty calendar days of the appointment of the first arbitrator. The Parties shall jointly appoint a third arbitrator within two months of the appointment of the second arbitrator. 5. The arbitrators decisions shall be taken by majority vote within six months of the third arbitrator being appointed. 7. The JIC shall establish the working procedures for arbitration. 1. A Party wishing to suspend this Agreement shall notify the other Party in writing of its intention to do so. The matter shall subsequently be discussed between the Parties. 2. Either Party may suspend the application of this Agreement. The decision on suspension and the reasons for that decision shall be notified to the other Party in writing. 3. The conditions of this Agreement will cease to apply thirty calendar days after such notice is given. 4. Application of this Agreement shall resume thirty calendar days after the Party that has suspended its application informs the other Party that the reasons for the suspension no longer apply. 1. Either Party wishing to amend this Agreement shall put the proposal forward at least three months before the next meeting of the JIC. The JIC shall discuss the proposal and if consensus is reached, it shall make a recommendation. If the Parties agree with the recommendation, they shall approve it in accordance with their respective internal procedures. 2. Any amendment so approved by the Parties shall enter into force on the first day of the month following the date on which the Parties notify each other of the completion of the procedures necessary for this purpose. 3. The JIC may adopt amendments to the Annexes to this Agreement. 4. Notification of any amendment shall be made to the Secretary-General of the Council of the European Union and to the Minister for Foreign Affairs of the Republic of Indonesia through diplomatic channels. 1. This Agreement shall enter into force on the first day of the month following the date on which the Parties notify each other in writing of the completion of their respective procedures necessary for this purpose. 3. This Agreement shall remain in force for a period of five years. It shall be extended for consecutive periods of five years, unless a Party renounces the extension by notifying the other Party in writing at least twelve months before this Agreement expires. 4. Either Party may terminate this Agreement by notifying the other Party in writing. This Agreement shall cease to apply twelve months after the date of such notification. This Agreement shall be drawn up in duplicate in the Bulgarian, Croatian, Czech, Danish, Dutch, English, Estonian, Finnish, French, German, Greek, Hungarian, Italian, Latvian, Lithuanian, Maltese, Polish, Portuguese, Romanian, Slovak, Slovenian, Spanish, Swedish and Indonesian (Bahasa Indonesia) languages, each of these texts being authentic. In case of divergence of interpretation the English text shall prevail. Съставено в Брюксел на тридесети септември две хиляди и тринадесета година. Hecho en Bruselas, el treinta de septiembre de dos mil trece. V Bruselu dne třicátého září dva tisíce třináct. Udfærdiget i Bruxelles den tredivte september to tusind og tretten. Geschehen zu Brüssel am dreißigsten September zweitausenddreizehn. Kahe tuhande kolmeteistkümnenda aasta septembrikuu kolmekümnendal päeval Brüsselis. Έγινε στις Βρυξέλλες, στις τριάντα Σεπτεμβρίου δύο χιλιάδες δεκατρία. Done at Brussels on the thirtieth day of September in the year two thousand and thirteen. Fait à Bruxelles, le trente septembre deux mille treize. Sastavljeno u Bruxellesu tridesetog rujna dvije tisuće trinaeste. Fatto a Bruxelles, addì trenta settembre duemilatredici. Briselē, divi tūkstoši trīspadsmitā gada trīsdesmitajā septembrī. Priimta du tūkstančiai tryliktų metų rugsėjo trisdešimtą dieną Briuselyje. Kelt Brüsszelben, a kétezer-tizenharmadik év szeptember havának harmincadik napján. Magħmul fi Brussell, fit-tletin jum ta’ Settembru tas-sena elfejn u tlettax. Gedaan te Brussel, de dertigste september tweeduizend dertien. Sporządzono w Brukseli dnia trzydziestego września roku dwa tysiące trzynastego. Feito em Bruxelas, em trinta de setembro de dois mil e treze. Întocmit la Bruxelles la treizeci septembrie două mii treisprezece. V Bruseli tridsiateho septembra dvetisíctrinásť. V Bruslju, dne tridesetega septembra leta dva tisoč trinajst. Tehty Brysselissä kolmantenakymmenentenä päivänä syyskuuta vuonna kaksituhattakolmetoista. Som skedde i Bryssel den trettionde september tjugohundratretton. Dibuat di Brussel, pada tanggal tiga puluh bulan September tahun dua ribu tiga belas. Casks, barrels, vats, tubs and other coopers' products and parts thereof, of wood, including staves. Builders' joinery and carpentry of wood, including cellular wood panels, assembled flooring panels, shingles and shakes. Toilet or facial tissue stock, towel or napkin stock and similar paper of a kind used for household or sanitary purposes, cellulose wadding and webs of cellulose fibres, whether or not creped, crinkled, embossed, perforated, surface -coloured, surface-decorated or printed, in rolls or sheets. Uncoated kraft paper and paperboard, in rolls or sheets, other than that of heading 4802 or 4803. Other Uncoated paper and paperboard, in rolls or sheets, not further worked or processed than as specify in Note 3 to this chapter. Paper and paperboard, corrugated (with or without glued flat surface sheets), creped, crinkled, embossed or perforated, in rolls or sheets, other than paper of the kind described in heading 4803. Paper and paperboard, coated on one or both sides with kaolin (China clay) or other inorganic substances, with or without binder, and with no other coating, whether or not surface-coloured, surface-decorated or printed, in rolls or rectangular (including square) sheets, of any size. Paper, paperboard, cellulose wadding and webs of cellulose fibres, coated, impregnated, covered, surface-coloured, surface-decorated or printed, in rolls or rectangular (including square) sheets, of any size, other than goods of the kind described in heading 4803, 4809 or 4810. Cigarette paper, whether or not cut to size or in the form booklets or tubes. Wallpaper and similar wall covering; window transparencies of paper. Carbon paper, self-copy paper and other copying or transfer papers (other than those of heading 4809), duplicator stencils and offset plates, of paper, whether or not put up in boxes. Envelopes, letter cards, plain postcards and correspondence cards, of paper or paper board; boxes, pouches, wallets and writing compendiums, of paper or paperboard, containing an assortment of paper stationary. Toilet paper and similar paper, cellulose wadding or webs of cellulose fibres, of a kind used for household or sanitary purposes, in rolls of a width not exceeding 36 cm, or cut to size or shape; handkerchief, cleansing tissues, towels, tablecloths, serviettes, napkins for babies, tampons, bed sheets and similar household, sanitary or hospital articles, articles of apparel and clothing accessories, of paper pulp, paper, cellulose wadding or webs of cellulose fibres. Bobbins, spools, cops and similar support of paper pulp, paper or paper board whether or not perforated or hardened. Other paper, paperboard, cellulose wadding and webs cellulose fibres, cut to size or shape; other articles of paper pulp, paper, paperboard, cellulose wadding or webs of cellulose fibres. Indonesia has five legality standards articulated through a series of principles, criteria, indicators and verifiers, all based on the underlying laws, regulations and procedures. Legality Standard 5: the standard for primary and downstream forest based industries. These five legality standards and the associated verifiers are outlined below. The approved master plan & attachments, drawn up based on a comprehensive forest inventory conducted by technically competent staff. Timber forest product utilisation master plan document & attachments (ongoing applications are acceptable). Permit holder has an approved Environmental Impact Assessment (EIA) document and has implemented measures identified in it. Permit holder has EIA documents approved by the competent authorities which cover the entire work area. Permits for all harvesting equipment are valid and can be physically verified in the field. Permits for equipment and equipment transfer. Regulation of the Minister for Forestry P53/2009. Permit holders ensure that all the logs transported from a log yard in the forest to a primary forest products industry or registered log trader, including via an intermediate log yard are physically identified and accompanied by valid documents. All large diameter logs which have been harvested or commercially extracted are reported in the Timber Production Report. All the logs transported out of the permit area are accompanied by a legal transport document. Permit holder has environmental impact assessment documents approved by the competent authorities which cover the entire work area. Invoice/ sales receipt/ freight clearance. Harvesting operation authorised under Other Legal Permit (ILS) / conversion permits (IPK) in a lease area. Timber harvesting authorised under a land conversion permit (IPK). Evidence of payment of charges. Proof of payment of Reforestation Funds, Forest Resources Fee and compensation to the state for the value of stumpage cut. Timber forest product processing industry supports the realization of legal trade in timber. Availability of Raw Materials Stock Planning (RPBBI) for Forest Products Primary Industry (IPHH). The business groups (cooperatives / limited partnership (CV) / other business groups) are legally established. Registration of the traders as Non-Producer Exporters of Forestry Industry Products (ETPIK Non Produsen). Transport documents (SKAU/ Nota) with corresponding official reports from the officer of the local authority with respect to used timber from demolished buildings/ structures, unearthed timber and buried timber. Segregation/ separation of produced products. Documentation of raw materials, processes, production and where applicable of exports if export is conducted through the business unit / another company with which collaboration agreement is entered into. Legality of the trade or the change of ownership of processed timber. Inter-island transportation and trade complies with applicable legislation. The business unit shipping processed timber products inter-island are Registered Interisland Timber Traders (PKAPT). The vessel used to transport processed timber is Indonesian-flagged and possesses valid permits to operate. Documents showing identity of vessel. Registration documents which show the identity of the vessel and valid permit. Regulation of the Minister for Finance 223/PMK.011/2008. The licence shall be lodged with the competent authority of the Union Member State in which the shipment covered by that licence is presented for release for free circulation. This can be done electronically or by other expeditious means. A licence shall be accepted if it meets all the requirements set out in Annex IV and no further verification in accordance with sections 3, 4 and 5 of this Annex is deemed necessary. A licence may be lodged before the arrival of the shipment it covers. Any licence which does not meet the requirements and specifications set out in Annex IV is invalid. Erasures in or alterations to a licence shall only be accepted if such erasures or alterations have been validated by the Licensing Authority. A licence shall be considered as void if it is lodged with the competent authority after the expiry date indicated in the licence. The extension of the validity of a licence shall not be accepted unless that extension has been validated by the Licensing Authority. A duplicate or replacement licence shall not be accepted unless it has been issued and validated by the Licensing Authority. Where further information is required on the licence or on the shipment, in accordance with this Annex, the licence shall be accepted only after the required information has been received. Where the volume or weight of the timber products contained in the shipment presented for release for free circulation does not deviate by more than ten per cent from the volume or weight indicated in the corresponding licence, it shall be considered that the shipment conforms to the information provided in the licence in so far as volume or weight is concerned. The competent authority shall, in accordance with the applicable legislation and procedures, inform the customs authorities as soon as a licence has been accepted. In case of doubt concerning the validity or authenticity of a licence, a duplicate or a replacement licence, the competent authority may request additional information from the Licence Information Unit. The Licence Information Unit may request the competent authority to send a copy of the licence in question. If necessary the Licensing Authority shall withdraw the licence and issue a corrected copy which will be authenticated by the stamped endorsement "Duplicate" and forward it to the competent authority. If no answer is received by the competent authority within twenty-one calendar days of the request for additional information from the Licence Information Unit, as specified in section 3.1 of this Annex, the competent authority shall not accept the licence and shall act in accordance with applicable legislation and procedures. If the validity of the licence is confirmed, the Licence Information Unit shall inform the competent authority forthwith, preferably by electronic means. The copies returned shall be authenticated by the stamped endorsement "Validated on". If following the provision of additional information and further investigation, it is determined that the licence is not valid or authentic the competent authority shall not accept the licence and shall act in accordance with applicable legislation and procedures. If further verification of the shipment is considered necessary before the competent authorities can decide whether a licence can be accepted, checks may be carried out to establish whether the shipment in question conforms to the information provided in the licence and/or to the records relating to the relevant licence held by the Licensing Authority. In case of doubt as to the conformity of the shipment with the licence the competent authority concerned may seek further clarification from the Licence Information Unit. The Licence Information Unit may request the competent authority to send a copy of the licence or the replacement in question. If necessary, the Licensing Authority shall withdraw the licence and issue a corrected copy which must be authenticated by the stamped endorsement "Duplicate" and forwarded to the competent authority. If no answer is received by the competent authority within twenty one calendar days upon request of the further clarification as specified in section 4.2 above, the competent authority shall not accept the licence and shall act in accordance with applicable legislation and procedures. If following the provision of additional information and further investigation, it has been determined that the shipment in question does not conform with the licence and/or to the records relating to the relevant licence held by the Licensing Authority, the competent authority shall not accept the licence and shall act in accordance with applicable legislation and procedures. Costs incurred while the verification is being completed shall be at the expense of the importer, except where the applicable legislation and procedures of the Union Member State concerned determine otherwise. Where persistent disagreements or difficulties arise from the verification of licences the matter may be referred to the JIC. The number of the licence that covers the timber products that are being declared for release for free circulation shall be entered in Box 44 of the Single Administrative Document on which the customs declaration is made. Shipments of timber products shall be released for free circulation only when the procedure described in section 2.7 above has been duly completed. A FLEGT licence may be in paper or electronic form. Both paper-based and electronic licences shall provide the information specified in Appendix 1, in accordance with the notes for guidance set out in Appendix 2. A FLEGT licence shall be numbered in a manner that allows the Parties to distinguish between a FLEGT licence covering shipments destined for Union markets and a V-Legal Document for shipments destined for non-Union markets. A FLEGT licence shall be valid from the date on which it is issued. The period of validity of a FLEGT licence shall not exceed four months. The date of expiry shall be indicated on the licence. A FLEGT licence shall be considered void after it has expired. In the event of force majeure or other valid causes beyond the control of the licensee, the Licensing Authority may extend the period of validity for an additional two months. The Licensing Authority shall insert and validate the new expiry date when granting such an extension. A FLEGT licence shall be considered void and returned to the Licensing Authority if the timber products covered by that licence have been lost or destroyed prior to its arrival in the Union. The paper size will be standard A4. The paper will have watermarks showing a logo that will be embossed on the paper in addition to the seal. A FLEGT licence shall be completed in typescript or by computerised means. It may be completed in manuscript, if necessary. The stamps of the Licensing Authority shall be applied by means of a stamp. However, an embossment or perforation may be substituted for the Licensing Authority stamp. The Licensing Authority shall use a tamper-proof method to record the quantity allocated in such a way as to make it impossible to insert figures or references. The form shall not contain any erasures or alterations, unless those erasures or alterations have been authenticated by the stamp and signature of the Licensing Authority. A FLEGT licence shall be printed and completed in English. The copies marked "Original", "Copy for Customs at destination" and "Copy for the Importer" shall be given to the licensee, who shall send them to the importer. The importer shall lodge the original with the competent authority and the relevant copy with the customs authority of the Member State of the Union in which the shipment covered by that licence is declared for release for free circulation. The third copy marked "Copy for the Importer" shall be retained by the importer for the importer's records. The fourth copy marked "Copy for the Licensing Authority" shall be retained by the Licensing Authority for its records and for possible future verification of licences issued. The fifth copy marked "Copy for the Licensee" shall be given to the licensee for the licensee's records. The sixth copy marked "Copy for the Licence Information Unit" shall be given to the Licence Information Unit for its records. The seventh copy marked "Copy for Indonesian Customs" shall be given to the customs authority of Indonesia for exportation purposes. In the event of loss, theft or destruction of the copy marked "Original" or the copy marked "Copy for Customs at destination" or both, the licensee or the licensee's authorised representative may apply to the Licensing Authority for a replacement. Together with the application, the licensee or the licensee's authorised representative shall provide an explanation for the loss of the original and/or the copy. If it is satisfied with the explanation, the Licensing Authority shall issue a replacement licence within five working days of receipt of the request from the licensee. The replacement shall contain the information and entries that appeared on the licence it replaces, including the licence number, and shall bear the endorsement "Replacement Licence". In the event that the lost or stolen licence is retrieved, it shall not be used and must be returned to the Licensing Authority. The FLEGT licence may be issued and processed using electronic systems. In Member States of the Union which are not linked to an electronic system a paper-based licence shall be made available. ISO codes, where indicated, refer to the international standard two letter code for any country. Insert "European Union" if the licence covers a shipment destined for the European Union. Insert "FLEGT" if the licence covers a shipment destined for the European Union. Indicate the name, address, and registration number of the Licensing Authority. Indicate the name and address of the importer, the total value (in USD) of the shipment, as well as the name and the two-letter ISO code of the country of destination and where applicable of the country of transit. Period of validity of the licence. This refers to the partner country from where the timber products were exported to the EU. Indicate the two-letter ISO code for the partner country referred to in Box 5. Indicate the means of transport at the point of export. Indicate the name and address of the exporter, including the registered exporter ETPIK and tax payer numbers. Indicate the commercial description of the timber product(s). The description should be sufficiently detailed to allow for classification into the HS. For the "Original", "Copy for Customs at Destination" and "Copy for Importer" indicate the four-digit or six-digit commodity code established pursuant to the Harmonised Commodity Description and Coding System. For copies for use within Indonesia (copies (iv) to (vii) as set out in Article 3.1 of Annex IV) indicate the ten-digit commodity code in accordance with the Indonesia Customs Tariff Book. Indicate the common and scientific names of the species of timber used in the product. Where more than one species is included in a composite product, use a separate line. May be omitted for a composite product or component that contains multiple species whose identity has been lost (e.g. particle board). Indicate the countries where the species of timber referred to in Box 10 was harvested. Where a composite product include for all sources of wood used. May be omitted for a composite product or component that contains multiple species whose identity has been lost (e.g. particle board). Indicate the ISO code of the countries referred to in box 12. May be omitted for a composite product or component that contains multiple species whose identity has been lost (e.g. particle board). Indicate the overall volume in m3. May be omitted unless the information referred to in box 15 has been omitted. Indicate the overall weight of the shipment at the time of measurement in kg. This is defined as the net mass of the timber products without immediate containers or any packaging, other than bearers, spacers, stickers etc. Indicate the number of units, where a manufactured product is best quantified in this way. May be omitted. Insert barcode and any distinguishing marks where appropriate e.g. lot number, bill of lading number. May be omitted. The box shall be signed by the authorised official and stamped with the official stamp of the Licensing Authority. 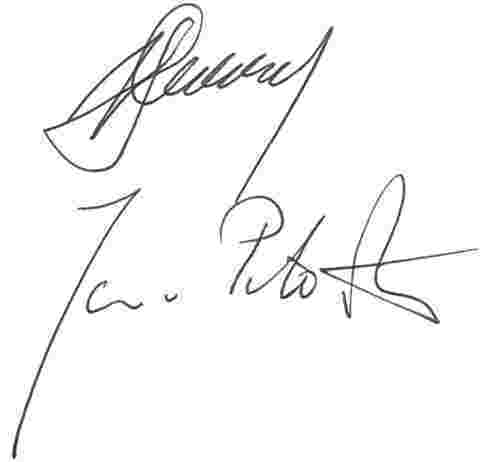 The signatories' name, as well as place and date shall also be indicated. Known for its pioneering role in combating illegal logging and the trade in illegally harvested timber and timber products, Indonesia hosted the East Asia Ministerial Conference on Forest Law Enforcement and Governance (FLEG) in Bali, in September 2001, which resulted in the Declaration on Forest Law Enforcement and Governance' (Bali Declaration). Since then, Indonesia has continued to be at the forefront of international cooperation in combating illegal logging and associated trade. As part of international efforts to address these issues, a growing number of consumer countries have committed themselves to take measures to prevent trade in illegal timber on their markets, whilst producer countries have committed themselves to provide a mechanism assuring the legality of their timber products. It is important to establish a credible system to guarantee the legality of harvesting, transportation, processing and trade of timber processed timber products. The Indonesian regulation on the "Standards and Guidelines on the Assessment of Performance of Sustainable Forest Management and the Verification of Timber Legality in the State and Privately-owned Forests" (Forestry Minister's Regulation P.38/Menhut-II/2009) establish the TLAS as well as the sustainability scheme (SFM), to improve forest governance; to suppress illegal logging and the associated timber trade and to ensure the credibility and improve the image of Indonesia's timber products. Since 2003, a wide range of Indonesian forestry stakeholders have been actively engaged in developing, implementing and evaluating the TLAS, thereby providing better oversight, transparency and credibility in the process. In 2009, the multi-stakeholder process resulted in the issuance of Forestry Minister's Regulation P.38/Menhut-II/2009, followed by DG Forest Utilization Technical Guidelines No.6/VI-SET/2009 and No.02/VI-BPPHH/2010. Indonesian forest resources can broadly be divided into two types of ownership: state forests and privately owned forests/lands. State forests consist of production forests for long-term sustainable timber production under a variety of permit types and forest areas that can be converted for non-forestry purposes such as for settlement or plantations. The application of TLAS on state forests and privately owned forests/lands is set out in Annex II. The TLAS covers timber and timber products from all permit types as well as the operations of all timber traders, downstream processors and exporters. The TLAS requires that imported timber and timber products are cleared at customs and comply with Indonesia's import regulations. Imported timber and timber products must be accompanied by documents providing assurance of the legality of the timber in its country of harvest. Imported timber and timber products will have to enter into a controlled supply chain that complies with the Indonesian rules and regulations. Indonesia will provide guidance on how to implement the above. Certain timber products may contain recycled materials. Indonesia provides guidance on how the use of recycled materials will be dealt with under the TLAS. Impounded timber is not included in the TLAS and therefore cannot be covered by a FLEGT licence. The TLAS covers timber products destined for domestic and international markets. All Indonesian producers, processors, and traders (operators) will be verified for legality, including those supplying the domestic market. The TLAS has five timber legality standards. These standards and their verification guidelines are set out in Annex II. The TLAS also incorporates the "Standard and Guidelines on Assessment of Performance in Sustainable Forest Management (SFM)". The assessment of sustainable forest management using the SFM standard also verifies that the auditee complies with the relevant legality criteria. SFM-certified organisations operating within production forest zones on state-owned lands (permanent forest domain) adhere to both relevant legality and SFM standards. The permit holder (in the case of concessions) or landowner (in the case of private land) or company (in the case of traders, processors and exporters) shall demonstrate that every node of their supply chain is controlled and documented as set out in the Minister for Forestry Regulations P.55/Menhut-II/2006 and P.30/Menhut-II/2012 (hereinafter referred to as the Regulations). These Regulations require provincial and district forestry officials to undertake field verification and validate the documents which are submitted by permit holders, landowners, or processors at each node of the supply chain. The operational controls at each point in the supply chain are summarised in Diagram 1; the guidance for imports is being developed. All consignments in the supply chain must be accompanied by relevant transport documents. Companies must apply appropriate systems to segregate between timber and timber products from verified sources with timber and timber products from other sources, and maintain records that distinguish between these two sources. Companies at each point in the supply chain are required to record whether the involved logs, products or timber consignment are TLAS-verified. Operators in the supply chain are required to keep records on received, stored, processed and delivered timber and timber products so as to enable subsequent reconciliation of quantitative data between and within nodes of the supply chain. Such data shall be made available for provincial and district forestry officials to carry out reconciliation tests. Main activities and procedures, including reconciliation, for each stage of the supply chain are further explained in the Appendix of this Annex. Diagram 1: Control of the supply chain which shows the required key documents at each point in the supply chain. The Indonesian TLAS is based on an approach known as "operator-based licensing" which has much in common with product or forest management certification systems. The Indonesian Ministry of Forestry nominates a number of conformity assessment bodies (LP and LV) which it authorizes to audit the legality of operations of timber producers, traders, processors and exporters ("operators"). The conformity assessment bodies (CAB) are accredited by the Indonesian National Accreditation Body (KAN). CAB are contracted by operators who want their operations to be certified as legal and are required to operate according to relevant ISO guidelines. They report the outcome of the audits to the auditee and to the Ministry of Forestry. The CAB ensure that the auditees operate in compliance with the Indonesian legality definition as contained in Annex II, including controls to prevent material from unknown sources entering their supply chains. When an auditee is found to be compliant, a legality certificate with a validity of 3 (three) years is issued. LVs also act as export licensing authorities and check verified exporters' supply chain control systems. If compliant, they issue export licences in the form of V-Legal Documents. Thus exports without an export permit are prohibited. Indonesia has enacted a regulation which allows civil society groups to raise objections on the legality verification of an operator by CAB or in the event of illegal activities detected during operations. In case of complaints about the operations of a conformity assessment body, civil society groups can file complaints with KAN. The conformity assessment bodies play a key role in the Indonesian system. They are contracted to verify the legality of the production, processing and trade activities of individual companies in the supply chain, including the integrity of the supply chain. LV also issue V-Legal Documents for individual shipments of exported timber. There are two types of CAB: (i) assessment bodies (Lembaga Penilai/LP) which audits the performance of Forest Management Units (FMUs) against the sustainability standard; and (ii) verification bodies (Lembaga Verifikasi/LV), which audit FMUs and forest-based industries against the legality standards. In order to ensure those audits that verify the legality standards as set out in Annex II are of the highest quality, the LP and LV are required to develop the necessary management systems addressing competency, consistency, impartiality, transparency, and assessment process requirements as outlined in ISO/IEC 17021 (SFM Standard for LPs) and/or ISO/IEC Guide 65 (Legality Standards for LVs). These requirements are specified in the TLAS Guidelines. LVs can also act as Licensing Authorities. In this case the LVs issue export licences to cover timber products destined to international markets. For non-Union markets, the Licensing Authorities will issue V-Legal Documents, and as for the Union market, FLEGT licenses will be issued in accordance with the requirements as outlined in Annex IV. Indonesia is developing detailed procedures for the V-Legal Document or FLEGT licensing of export consignments. The LVs are contracted by the auditees to carry out legality audits and will issue TLAS legality certificates and V-Legal document or FLEGT licences for exports to international markets. LPs will audit timber producing concessions against the SFM standard. LPs do not issues export licences. The Indonesian National Accreditation Body (Komite Akreditasi Nasional - KAN) is responsible for the accreditation of CAB. 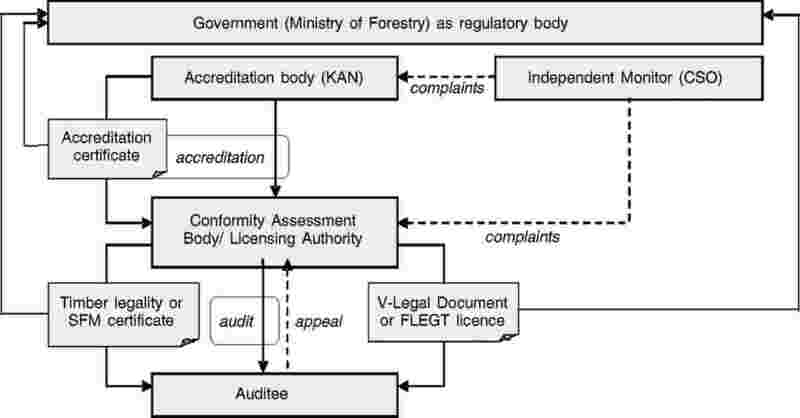 In case of problem with a LP or LV, complaints can be submitted to the KAN.
On 14 July 2009, the KAN signed a Memorandum of Understanding with the Ministry of Forestry to provide accreditation services for the TLAS. KAN is an independent accreditation body established through Government Regulation (Peraturan Pemerintah/PP) 102/2000 concerning National Standardisation and Presidential Decree (Keputusan Presiden/Keppres) 78/2001 regarding the National Accreditation Committee. The KAN operates under the guidance of ISO/IEC 17011 (General Requirements for Accreditation Bodies Accrediting Conformity Assessment Bodies). It has developed internal TLAS-specific supporting documents for the accreditation of LPs (DPLS 13) and LVs (DPLS 14). In addition, the KAN will develop requirements and guidance for the accreditation of LVs for export licensing. Auditees are operators which are subject to legality verification. They include forest management units (concessionaires or timber utilization permit holders, community-based forest permit holders, private forest/land owners) and forestry-based industries. The forest management units and forest-based industries must comply with the applicable TLAS standard. For export purposes, the forest-based industries must comply with export licensing requirements. The system allows auditees to submit appeals to the LP or LV on the conduct of or results of audits. Civil society plays a key role in the Independent Monitoring (IM) of the TLAS. Findings from the Independent Monitor can also be used as part of the Periodic Evaluation (PE) which is required under this Agreement. In the event of an assessment-related irregularity, complaints by civil society shall be submitted directly to the concerned LP or LV. If no appropriate response is given to the complaints, civil society entities may file a report to the KAN. For accreditation-related irregularities, complaints shall be submitted directly to the KAN. Whenever civil society entities discover wrongdoings by operators, they can lodge complaints with the relevant LP or LV. The Ministry of Forestry regulates the TLAS and authorises the accredited LPs to undertake SFM assessment and LVs to undertake legality verification and to issue V-Legal Documents. Furthermore, the Ministry of Forestry also regulates the Licence Information Unit (LIU) as a unit responsible for information exchange which receives and stores relevant data and information on the issuance of V-Legal Documents and which responds to queries from competent authorities or stakeholders. Indonesian timber is deemed legal when its origin and production process as well as subsequent processing, transport and trade activities are verified as meeting all applicable Indonesian laws and regulations, as set out in Annex II. LVs carry out conformity assessments to verify compliance. Application and contracting: The permit holder submits to the LV an application that defines the scope of verification, permit holder's profile and other necessary information. A contract between the permit holder and the LV, setting out the conditions for verification, is required prior to the commencement of the verification activities. Verification plan: After the signing of the verification contract, the LV prepares a verification plan, which includes nomination of the audit team, verification programme and schedule of activities. The plan is communicated to the auditee and the dates of verification activities agreed upon. This information shall be made available in advance for the independent monitors through the websites of LVs and the Ministry of Forestry or mass media. Verification activities: The verification audit consists of three stages: (i) opening audit meeting, (ii) document verification & field observation and (iii) closing audit meeting. Document verification and field observation stage: in order to collect evidence on the auditee's compliance with the Indonesian TLAS requirements, LV checks the auditee's systems and procedures, relevant documents and records. LV carries out field checks to verify compliance, including cross-checking the findings of official inspection reports. LV also checks the auditee's timber traceability system to ensure that, with adequate evidence, all timber meets the legality requirements. Closing audit meeting: the verification results, in particular any non-compliances that may be detected, are presented to the auditee. The auditee may raise questions on the verification results and provide clarification on the evidence presented by the LV. Reporting and decision making: The audit team draws up a verification report, following a structure provided by the Ministry of Forestry. The report is shared with the auditee within fourteen calendar days after the closing audit meeting. A copy of the report, which includes a description of any findings of non-compliances, is submitted to the Ministry of Forestry. The report is used primarily to decide on the outcome of the verification audit by the LV. The LV takes the decision on whether to issue a legality certificate based on the verification report prepared by the audit team. In cases of non-compliance, the LV will refrain from issuing a legality certificate, which will prevent the timber from entering the supply chain of verified legal timber. Once the non-compliance has been addressed, the operator may resubmit a request for legality verification. Infringements, which are discovered by LV during the verification and reported to the Ministry of Forestry, shall be handled by the responsible authorities in accordance with administrative or judicial procedures. If an operator is suspected of breaching regulations, the national, provincial and district authorities may decide to halt the operator's activities. Issuance of the legality certificate and recertification: the LV will issue a legality certificate if an auditee is found to comply with all the indicators in the legality standard, including the rules on control of the timber supply chain. The LV may report at any time to the Ministry of Forestry on issued, changed, suspended and withdrawn certificates and every three months shall issue a report. The Ministry of Forestry will then publish these reports on its website. A legality certificate is valid for a period of three years, after which the operator is subject to a re-certification audit. The re-certification shall be done prior to the expiry date of the certificate. Surveillance: Operators with a legality certificate are subject to annual surveillance that follow the principles of the verification activities summarised above. The LV may also carry out surveillance earlier than scheduled before the annual audit if the scope of the verification has been extended. The surveillance team draws up a surveillance report. A copy of the report, including a description of any non-compliance found, is submitted to the Ministry of Forestry. Non-compliances detected by the surveillance will result in to suspension or withdrawal of the legality certificate. Infringements discovered by the LV during the surveillance and reported to the Ministry of Forestry shall be handled by the relevant authorities, in accordance with administrative or judicial procedures. Infringements detected by forestry officials or by independent monitors are communicated to the LV, which upon verification may lead the LV to suspend or withdraw the awarded legality certificate. Forestry officials may take appropriate follow-up action in accordance with the regulatory procedures. The Ministry of Forestry also receives copies of the verification reports and subsequent surveillance and special audit reports issued by the LVs. Infringements discovered by the LVs, by forestry officials or by independent monitors are handled in accordance with administrative and judicial procedures. If an operator is suspected of breaching regulations, the national, provincial and district authorities may decide to suspend or halt the operator's activities. The Indonesian FLEGT licence is known as the "V-Legal Document". This is an export licence that provides evidence that the timber products exported meet the Indonesian legality standard as set out in Annex II and were sourced from a supply chain with adequate controls against the inflow of timber from unknown sources. The V-Legal Document is issued by the LVs who act as Licensing Authorities and will be used as a FLEGT licence for shipments to the Union once the parties have agreed to start the FLEGT licensing scheme. Indonesia will clearly define the procedures for issuing V-Legal Documents and communicate these procedures to the exporters and any other parties concerned through its licensing authorities (the LVs) and the website of the Ministry of Forestry. The Ministry of Forestry has established a Licence Information Unit to maintain a database with copies of all V-Legal Documents and LV non-compliance reports. In the event of an inquiry concerning the authenticity, completeness, and validity of the V-Legal Document or FLEGT licence, the competent authorities in the Union will contact the Licence Information Unit in the Ministry of Forestry for further clarification. This unit will communicate with the relevant LV. The Licence Information Unit will respond to the competent authorities upon receipt of the information from the LV. The V-Legal Document is issued by the LV, which holds a contract with the exporter, for the consignment of timber products to be exported. 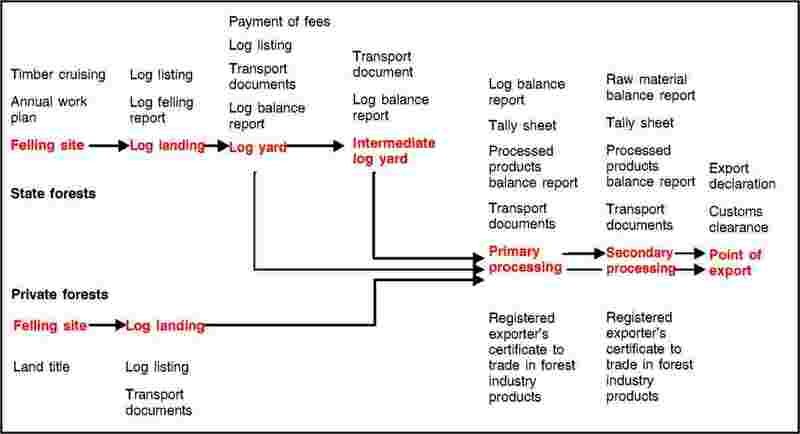 The exporter's internal traceability system shall provide evidence on the legality of timber for export licensing. This system shall at minimum cover all the supply chain related controls from the stage where the raw materials (such as logs or semi-processed products) were dispatched to the processing mill, within the mill site itself and from the mill to the point of export. With regard to the primary industry, the exporter's traceability system shall at minimum cover transportation from the log landing or log yard and all the subsequent stages until the point of export. With regard to the secondary industry, the traceability system shall at minimum cover transportation from the primary industry and all subsequent stages until the point of export. If managed by the exporter, any previous stage of the supply chain as referred to in 6.2.1 and 6.2.2 shall also be included in the exporter's internal traceability system. If managed by a legal entity than the exporter, the LV shall verify that the previous stages of the supply chain as referred to in 6.2.1 and 6.2.2 are controlled by the exporter's supplier(s) or sub-supplier(s), and that the transport documents state whether the timber originates or does not originate from a felling site that has not been certified for legality. For a V-Legal Document to be issued, all suppliers in the exporter's supply chain that make up the consignment must have been covered by a valid legality or SFM certificate and must demonstrate that at all stages in the supply chain the supply of legally verified timber has been kept segregated from supplies not covered by a valid legality or SFM certificate. Where necessary, a field visit may be conducted after data reconciliation so as to ensure consistency with the information to be specified in the V-Legal Document. This may be done through export consignments sample checking and inspecting the factory operation and record-keeping. An ETPIK holder meeting the above mentioned requirements is allowed to use conformity marking on the products and/or packaging. Guidelines on the use of conformity marking have been developed. If an ETPIK holder does not comply with the legality and supply chain requirements, LV will issue a non-compliance report instead of V-Legal Document. The Indonesian TLAS includes civil society monitoring (Independent Monitoring) and Comprehensive Evaluation (CE). To make the system even more robust for a FLEGT-VPA, a Period Evaluation (PE) component is added. IM is carried out by civil society to assess compliance of the operators, LPs, and LVs with the Indonesian TLAS requirements including accreditation standards and guidelines. Civil society is defined in this context as Indonesian legal entities including forestry NGOs, communities living in and around the forest, and individual Indonesian citizens. CE is carried out by multi-stakeholder team which review the Indonesian TLAS and identify gaps and possible system improvements as mandated by the Ministry of Forestry. The objective of PE is to provide independent assurance that the Indonesian TLAS is functioning as described, thereby enhancing the credibility of the FLEGT licences issued. PE makes use of the findings and recommendations of IM and CE. Terms of Reference for PE are set out in Annex VI. During harvesting operations, tags are used to ensure that the log is from an approved felling site, as described above. Approval of the Log Production Report by the district forestry official. The Log Production Report is used to calculate the required payment of the Forest Resources Fee and to the Reforestation Fund (as applicable). The district forestry official checks the number of logs, the tags and the total cumulative volume of logs extracted and declared in the Log Production Report against the quota approved in the Annual Work Plan. Logs are transported from the log-landing site to log yards and then either directly transported to a processing mill or to an intermediate log-yard. The permit holder prepares/updates the Log Balance-Sheet Report to record the quantity of incoming, stored and outgoing logs at the logyard. The district forestry official checks the Log Balance-Sheet Report comparing inflows, outflows and storage of logs at the log yard, based on Log Production Reports and relevant Log Transport Documents. The permit for establishment of an intermediate log-yard is granted by the forestry official based on a proposal submitted by the permit holder. An intermediate log-yard permit is valid for five years, but can be extended following review and approval by the forestry official. The permit holder completes the Log Transport Document following the format provided by the Ministry of Forestry. The Log Transport Document for moving logs from the intermediate log yard is completed by the permit holder. The district forestry official checks the consistency between the logs transported from the log-yard and the logs entering the intermediate log-yard. The permit holder updates the Log Balance-Sheet Report, which records inflows, outflows and storage of logs at the intermediate log-yard, based on the relevant Log Transport Documents. Timber harvesting operations on privately-owned forest/land are regulated by Minister of Forestry Regulation P.30/Menhut-II/2012 (hereinafter referred to as the Regulation). There are no legal requirements for the private owners of forest/lands to affix ID marks on trees inventoried for harvesting or on logs. Log yards and intermediate log yards are generally not used for timber harvested from privately-owned forest/lands. Control procedures for timber from privately-owned forest/lands differ between logs obtained from trees which were on the site when the land title was acquired and logs obtained from trees that have been planted since the title was acquired. They also depend on the tree species harvested. The payment of the Forest Resources Fee and to the Reforestation Fund applies to logs from trees already present on the site when the land title was awarded but does not apply to logs from trees established after the award of the land title. for species listed in Article 5(1) of the Regulation, the owner prepares an invoice, which serves as the transport document. for other species, the head of the village or appointed official issues the transport document. In the case of logs harvested from trees present on a site before the granting of the land title, the district forestry official issues the transport document. Based on the above, the head of village issues the Log Transport Document. The head of village or appointed official or the district forestry official compares the volume of harvested logs with the log-list. 3. DESCRIPTION OF THE OPERATIONAL CONTROL OF TIMBER SUPPLY CHAINS FOR INDUSTRY AND FOR EXPORT. Preparation of sales report of the mill. The company or mill sends sales reports of the mill to the district forestry office on a regular basis. The company checks the Log Balance-Sheet Report comparing inflows, outflows and storage of logs based on Log Transport Documents. The company checks the Processed Products Balance-Sheet Report comparing inflows, outflows and storage of products based on Timber Product Transport Documents. The district forestry official checks the reconciliation carried out by the company. Preparation of Sales Report by the company or factory. The company or factory sends Sales Reports to the district forestry office. The factory checks the Processed Timber Balance-Sheet Report comparing inflows, outflows and storage of materials based on Processed Timber Transport Documents and Processed Timber Tally Sheet. The company checks the Processed Products Balance-Sheet Report, comparing inflows, outflows and storage of products based on invoices. The above is subject to checks under the Forest Utilization Director-General Regulation P.8/VI-BPPHH/2011. The procedures and reconciliation processes for export of timber originating from state-owned forests and privately-owned forest/land are identical. Subject to a positive outcome of the verification of the Export Declaration Document, Customs issues an Export Approval Document/Nota Pelayanan Ekspor. Periodic Evaluation (PE) is an independent evaluation done by an independent third party, referred to as Evaluator. The objective of PE is to provide assurance that the TLAS is functioning as described, thereby enhancing the credibility of the FLEGT licences issued under this Agreement. The functioning of control measures from the point of production in the forest to the point of export of timber products. The data management and timber traceability systems supporting the TLAS, the issuance of FLEGT licences as well as the production, licensing and trade statistics relevant to this Agreement. The output of PE comprises regular reports presenting evaluation findings and recommendations on measures to be undertaken to address gaps and system weaknesses identified by the evaluation. Reporting findings to the Joint Implementation Committee (JIC). The Evaluator shall use a documented and evidence-based methodology which meets the requirements of ISO/IEC 19011, or equivalent. This shall include adequate checks of relevant documentation, operating procedures and records of the operations of the organisations responsible for implementing the TLAS, identification of any cases of non-compliance and system failures, and issuance of requests for corresponding corrective action. Use appropriate sampling and spot check methods to evaluate the work of the forest regulatory agencies, LPs and LVs, industries, and other relevant actors at all levels of forest activities, supply chain control, timber processing and export licensing, including cross checks with information on timber imports from Indonesia provided by the Union. The Evaluator shall have a mechanism in place for receiving and dealing with complaints that arise from its activities and findings. The Evaluator shall notify the JIC of all received complaints and the actions taken to resolve them. The Evaluator shall maintain the confidentiality of data it receives while carrying out its activities. PE shall be carried out at intervals of no more than twelve months starting from the date as agreed by the JIC in accordance with Article 14 (5) (e) of the Agreement. The financing of the PE shall be decided by the JIC. Independent Market Monitoring (IMM) is market monitoring done by an independent third party referred to as Monitor. The objective of Independent Market Monitoring (IMM) is to collect and analyse information on the acceptance of Indonesian FLEGT-licensed timber in the Union market, and review impacts of Regulation (EU) No 995/2010 of the European Parliament and of the Council of 20 October 2010 laying down the obligation of operators who place timber and timber products on the market and of related initiatives such as public and private procurement policies. Examination of the impact of other market-related measures taken in the Union such as public procurement policies, green building codes and private sector action such as trade codes of practice and corporate social responsibility. The output of IMM will comprise regular reports to the Joint Implementation Committee (JIC) containing its findings and recommendations on measures to strengthen the position of Indonesian FLEGT-licensed timber in the Union market and to improve the implementation of market-related measures to prevent illegally harvested timber from being placed on the Union market. progress with and impact of the implementation of policy measures to tackle trade in illegally harvested timber in the Union. actions by pressure groups that could affect demand for timber and timber products or markets for Indonesia's forest products trade. Reporting findings and recommendations to the JIC. The Monitor shall have a documented and evidence-based methodology. This shall include adequate analysis of relevant documentation, identification of any inconsistencies in the available trade data and information, and in-depth interviews with relevant actors on key indicators of the impacts and effectiveness of market-related measures. have systems to avoid any conflict of interest. The Monitor shall declare any potential conflict of interest that may arise and take effective action to mitigate it. Reports shall be submitted biennially and comprise: (i) a full report containing all relevant findings and recommendations; and (ii) a summary report based on the full report. Upon the request of the JIC the Monitor shall provide additional information to support or clarify its findings. The Monitor shall maintain the confidentiality of data it receives while carrying out its activities. Trade and customs: Compliance with legal requirements for trade and customs procedures. Have the definition of legality and the legality verification standards been amended since this Agreement was concluded? Have the relevant labour laws and regulations been included in the legality definitions as per Annex II? Were all relevant stakeholders consulted about these amendments and any subsequent changes to the legality verification system through a process that took adequate account of their viewpoints? Is it clear what legal instrument underpins each new element of the definition? Are criteria and indicators that can be used to test compliance with each element of the definition specified? Are the criteria and indicators clear, objective and operationally workable? Do the criteria and indicators clearly identify the roles and responsibilities of all relevant parties and does verification assess their performance? Does the definition of legality include the main areas of existing law and regulations outlined above? If not, why were certain areas of law and regulations left out from the definition? Systems to control the supply chain must provide credible assurance that timber products can be traced throughout the supply chain from harvesting or point of import to the point of export. It will not always be necessary to maintain physical traceability for a log, log load or timber product from the point of export back to the forest of origin, but it is always needed between the forest and the first point of mixing (e.g. a timber terminal or a processing facility). There is clear delineation of areas where forest resource use rights have been allocated and the holders of those rights have been identified. Does the control system ensure that only timber originating from a forest area with valid use rights enters the supply chain? Does the control system ensure that enterprises carrying out harvesting operations have been granted appropriate rights of use for the concerned forest areas? Are the procedures for issuing rights of harvesting and the information on such rights, including their holders, available in the public domain? There are effective mechanisms for tracing timber throughout the supply chain from harvesting to the point of export. The approach for identifying timber may vary, ranging from the use of labels for individual items to reliance on documentation accompanying a load or a batch. The selected method should reflect the type and value of timber and the risk of contamination with unknown or illegal timber. Are all supply chain alternatives, including different sources of timber, identified and described in the control system? Have methods to identify the product origin and to prevent mixing with timber from unknown sources in the following stages of the supply chain been defined and documented? In the event of concrete findings that unverified timber enters into the supply chain, have any weaknesses in the control system being identified e.g. the absence of an inventory of standing timber before harvesting from private forest/lands? Does Indonesia have a policy on the inclusion of recycled materials in the Indonesian TLAS and if so, has guidance on how to include recycled materials been developed? There are robust and effective mechanisms for measuring and recording the quantities of timber or timber products at each stage of the supply chain, including reliable and accurate pre-harvest estimations of the standing timber volume in each harvesting site. Which organisations are responsible for keeping records on the quantitative data? Are they adequately resourced in terms of personnel and equipment? What is the quality of the controlled data? Are all quantitative data recorded in a way that makes it possible to verify quantities with the prior and subsequent stages in the supply chain in a timely manner? What information on the supply chain control is made publicly available? How can interested parties access this information? Are there sufficient controls in place to exclude timber from unknown sources or timber which was harvested without legal harvesting rights? What control measures are applied to ensure that verified and unverified materials are segregated throughout the supply chain? There are adequate controls to ensure that imported timber and derived products have been legally imported. How is the legal import of timber and derived products demonstrated? What documents are required to identify the country of harvest and to provide assurance that imported products originate from legally harvested timber, as referred to in Annex V? Does the TLAS identify imported timber and timber products throughout the supply chain until they are mixed for manufacturing of processed products? Where imported timber is used, can the country of harvest origin be identified on the FLEGT licence (may be omitted for reconstituted products)? Verification provides adequate checks to ensure the legality of timber. It must be sufficiently robust and effective to ensure that any non-compliance with requirements, either in the forest or within the supply chain, is identified and prompt action is taken. Verification is carried out by a third-party organisation which has adequate resources, management systems, skilled and trained personnel, as well as robust and effective mechanisms to control conflicts of interest. Do the verification bodies have a valid accreditation certificate issued by the National Accreditation Body (KAN)? Does the government appoint bodies to undertake the verification tasks? Is the mandate (and associated responsibilities) clear and in the public domain? Do the verification bodies have adequate resources for carrying out verification against the legality definition and the systems for controlling the timber supply chain? ensures its personnel have the necessary competence and experience to carry out effective verification? applies internal control / supervision? includes mechanisms to control conflicts of interest? ensures transparency of the system? defines and applies verification methodology? There is a clear definition that sets out what has to be verified. The verification methodology is documented and ensures that the process is systematic, transparent, evidence-based, carried out at regular intervals and covers everything included within the definition. Does the verification methodology used by the verification bodies cover all elements of the legality definition and include tests of compliance with all indicators? check documentation, operating records and on-site operations (including through spot checks)? collect information from external interested parties? Are the verification results made publicly available? How can interested parties access this information? There is a clear scope of criteria and indicators to be verified which covers the entire supply chain. The verification methodology is documented, ensures that the process is systematic, transparent, evidence-based, carried out at regular intervals, covers all criteria and indicators within the scope and includes regular and timely reconciliation of data between each stage in the chain. Does the verification methodology fully cover checks on supply chain controls? Is this clearly spelt out in the verification methodology? Which organisations are responsible for data verification? Do they have adequate human and other resources for carrying out the data management activities? Are there methods for assessing correspondence between standing timber, harvested logs and timber entering the processing facility or point of export? Are there methods to assess the coherence between inputs of raw materials and the outputs of processed products at sawmills and other plants? Do these methods include specification and periodic updating of conversion ratios? What information systems and technologies are applied for storing, verifying, and recording data? Are there robust systems in place for securing the data? Are the verification results on supply chain control made publicly available? How can the interested parties access this information? There are adequate mechanisms for handling complaints and disputes that arise from the verification process. Do verification bodies have a complaints mechanism that is available to all interested parties? Do the verification bodies have mechanisms in place to receive and respond to objections from the independent monitors? Do the verification bodies have mechanisms in place to receive and respond to infringements / breaches detected by government officials? There are adequate mechanisms for dealing with cases of non-compliance identified during the verification process or brought forward through complaints and independent monitoring. Is there an effective and functioning mechanism for requiring and enforcing appropriate corrective decision on verification results and action where breaches are identified? Have mechanisms been developed for handling cases of non-compliance? Are these applied in practice? Are there adequate records available on cases of non-compliance and of correction of the verification results, or on other actions taken? Is there an evaluation of the effectiveness of such actions? Is there a mechanism for reporting to the government on verification findings of the verification bodies? What kind of information on cases of non-compliance goes into the public domain? Indonesia has assigned overall responsibility for issuing V-Legal Document/FLEGT licences to licensing authorities. FLEGT licences are issued for individual shipments destined to the Union. Which bodies are assigned responsibility for issuing FLEGT licences? Does the Licensing Authority have a valid accreditation certificate issued by KAN? Are the roles of the Licensing Authority and its personnel with regard to the issuance of FLEGT licences clearly defined and publicly available? Does the Licensing Authority have adequate resources for carrying out its task? Adequate arrangements have been made to use V-Legal Documents for FLEGT licensing. Does the Licensing Authority have publicly available documented procedures for issuing a V-Legal Document? Are there adequate records on issued V-Legal Documents and on cases where V-Legal Documents were not issued? Do the records clearly show the evidence on which the issuing of V-Legal Documents is based? Does the Licensing Authority have adequate procedures to ensure that each shipment of timber meets the requirements of the legality definition and supply chain controls? Have the requirements for issuing licences been clearly defined and communicated to exporters and to other concerned parties? What kind of information on issued licences goes into the public domain? Do the FLEGT licences comply with the technical specifications contained in Annex IV? Has Indonesia developed a numbering system for FLEGT licences that enables differentiation between FLEGT licences destined to the Union market and V-Legal Documents destined to non-Union markets? There is an adequate mechanism in place for handling queries from competent authorities with regard to FLEGT licences, as set out in Annex III. Has a Licence Information Unit been assigned and established, inter alia, to receive and respond to inquiries from the competent authorities? Have clear communication procedures been established between the Licence Information Unit and the competent authorities? Have clear communication procedures been established between the Licence Information Unit and the Licensing Authority? Are there channels for Indonesian or international stakeholders to inquire about issued FLEGT licences? There is an adequate mechanism for handling complaints and disputes that arise from licensing. This mechanism makes it possible to deal with any complaint relating to the operation of the licensing scheme. Is there a documented procedure for handling complaints that is available to all interested parties? Independent Monitoring (IM) is conducted by Indonesia's civil society and is independent from other elements of the TLAS (those involved in the management or regulation of forest resources and those involved in the independent audit). One of the key objectives is to maintain the credibility of the TLAS by monitoring the implementation of verification. Indonesia has formally recognized the IM function and allows civil society to submit complaints when irregularities in the accreditation, assessment and licensing processes are found. Has the government made the guidelines for IM publicly available? Do the guidelines provide clear requirements on the eligibility of organisations to perform IM functions to ensure impartiality and avoid conflicts of interest? Do the guidelines provide procedures to access the information contained in Annex IX? Can civil society access the information contained in Annex IX in practice? Do the guidelines provide procedures for the submission of complaints? Are these procedures publicly available? Have reporting and public disclosure provisions that apply to verification bodies been clarified and established? The Parties are committed to ensuring that key forestry-related information is made available to the public. This Annex provides for this objective to be met by outlining (i) the forestry-related information to be made available to the public, (ii) the bodies responsible for making that information available, and (iii) the mechanisms by which it can be accessed. The aim is to ensure that (1) JIC operations during implementation of this Agreement are transparent and understood; (2) a mechanism exists for the Parties as well as relevant stakeholders to access key forestry-related information; (3) TLAS functioning is strengthened through the availability of information for independent monitoring; and (4) larger objectives of this Agreement are achieved. The public availability of information represents an important contribution to reinforcing Indonesia's forest governance. This Annex is in line with the Indonesian Law on Freedom of Information No. 14/2008. According to this Law, it is mandatory for every public institution to develop regulations on access to information by the public. The Law distinguishes four categories of information: (1) information available and actively disseminated on a regular basis; (2) information that should be made public without delay; (3) information that is available at all times and provided upon request; and (4) information that is restricted or confidential. The Ministry of Forestry (Ministry of Forestry), provincial and district offices, the National Accreditation Body (KAN), the conformity assessment body (CAB), the licensing authorities are all significant institutions in the functioning of the TLAS and therefore obliged as part of their duties to disclose forestry-related information to the public. To implement the said Law, the Ministry of Forestry, provincial and district offices and all other public agencies including KAN have developed or are developing procedures for making information available to the public. The KAN is also required to make information available to the public under ISO/IEC 17011:2004, clause 8.2-Obligation of the accreditation body. Verification bodies and licensing authorities are required to make information available to the public under Minister for Forestry Regulations and ISO/IEC 17021:2006 clause 8.1-Publicly accessible information and ISO/IEC Guide 65:1996 clause 4.8-Documentation. Civil society organisations function as one of the sources of forestry-related information under Minister for Forestry Regulations. The Minister for Forestry has issued Regulation No. P.7/Menhut-II/2011 dated 2 February 2011, which provides that requests for information held by the Ministry of Forestry are to be addressed to the Director of the Centre for Public Relations of the Ministry of Forestry in a "one-door" information policy. Further implementing guidance is being developed by Ministry of Forestry. Information available at regional, provincial, and district forestry offices can be accessed directly. To make this Annex operable, the procedures/guidelines/instructions for the mentioned institutions to respond to requests for information need to be developed and approved. In addition, the reporting and public disclosure provisions that apply to verification bodies and Licensing Authorities will be clarified. Laws and regulations: All laws, regulations, standards, and guidelines listed in the legality standards. Land and forest allocation: land allocation maps and provincial spatial plans, procedures for land allocation, forest concession or utilisation rights and other rights of exploitation and processing, and related document such as concession maps, forest area release permit, land title documents and land title maps. Forest management practices: forest use plans, annual work plans including maps and equipment permit, minutes of consultation meetings with communities living in and around permit area required for the development of the annual work plans, forest timber exploitation work plan and annexes, Environmental Impact Assessment documents and minutes of public consultation meetings required for the development of the Environmental Impact Assessment reports, log production reports, and stand inventory data in state-owned forest land. Transport and supply chain information, e.g. log or forest product transport documents and annexes and timber reconciliation reports, inter-island timber transportation registration documents, and documents showing ship identity. Processing and industry information: e.g. company establishment deed, business licence and company registration number, report of the Environmental Impact Assessment, industrial business licence or industrial registration numbers, industrial raw material supply plans for primary forest product industries, registration of the exporter of forest industry products, raw material and processed product reports, list of holders of rights to processing, and information on companies in secondary processing. Forest-related fees: e.g. area-based payment fees and payment slip invoices, payment orders and invoices for reforestation and forestry resource fees. Verification and licensing information: quality guidance and standard of procedures for accreditation; name and address of each accredited CAB dates of granting accreditation and expiry dates; scopes of accreditation; list of CAB personnel (auditors, decision makers) associated with each certificate; clarification on what is considered commercially confidential information; audit plan to know when public consultations take place; announcement of audit by CAB; minutes from public consultations with CAB including list of participants; public summary of audit result; recap reports by auditing body of certificate issuance; status report on all audits: certificates passed, failed, those currently in process, granted, suspended and withdrawn certificates and any changes to the above; cases of non-compliance relevant to audits and licensing and the action taken to deal with them; issued export licences; regular recap reports from licensing authorities. Monitoring and complaint procedures: standard operating procedures for complaints to KAN, verification bodies and licensing authorities, including procedures to monitor the progress of complaint reports and close out of complaint report. A list of key documents of relevance to forest monitoring, the agencies that hold these documents as well as the procedure by which this information can be acquired is contained in the appendix to this Annex. the number of cases and quantities of timber products involved where consultations between the competent authorities and the Indonesian Licence Information Unit were undertaken. Full report and summary report of the PE. Full report and summary report of the IMM. Complaints about the PE and the IMM and how they have been handled. Time schedule for implementation of this Agreement and overview of activities undertaken. This information will be made available through the websites of the Parties. the need to raise public sector and stakeholder awareness of the public disclosure provisions contained in this Agreement. Ministry of Law and Human Rights; for primary and integrated industry with capacity above 6 000 m3 copies in Ministry of Forestry (BUK), with capacity under 6 000 m3 copies in provincial and district forestry offices; for secondary industry copies in Ministry of Industry. Local investment office or investment coordinating agency (BKPMD), Ministry of Trade. For secondary industry copies in Ministry of Industry. Primary and integrated industry with capacity above 6 000 m3 copies in Ministry of Forestry (BUK), with capacity under 6 000 m3 copies in provincial forestry offices, with capacity under 2 000 m3 copies in district forestry offices; for secondary industry copies in Ministry of Industry. Primary and integrated industry with capacity above 6 000 m3 copies in Ministry of Forestry (BUK), with capacity under 6 000 m3 copies in provincial forestry offices, with capacity under 2 000 m3 copies in district forestry offices; copies in provincial and district forestry offices. The Freedom of Information Act (UU 14/2008) distinguishes four categories of information: (1) information available and actively disseminated on a regular basis; (2) information that should be made public immediately; (3) information that is available at all times and provided upon request and (4) restricted or confidential information. Information under category 3 of the Freedom of Information Act is provided to the public upon request to the designated body (PPID) within the respective institution, e.g. the Public Relations Centre of the Ministry of Forestry. Each institution has its own implementing regulation on public information, based on the Freedom of Information Act. Some information, although falling under Category 3 under the Freedom of Information Act is published on the websites of the relevant institutions, inter alia: decrees and regulations, land allocation maps, forest use plans.